In the headlong rush of science…in the late autumn of 2011…a rocket ship blasted off from Earth at 25,000 mph. 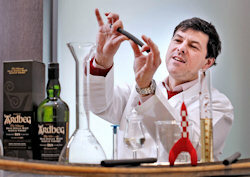 Deep within it no ordinary cargo; for the rocket carried research vials of precious Ardbeg-crafted molecules, the beginning of a fascinating first – a research experiment by Ardbeg...in space! This is the most audacious adventure ever undertaken by Ardbeg Distillery – or any other distillery for that matter – and it is set to be unveiled at Edinburgh’s International Science Festival on Tuesday 10 April. Ardbeg is taking part in an experiment led by US-based space research company NanoRacks LLC to test these micro-organic compounds. The maturation experiment will test the interaction of these Ardbeg-crafted molecules with charred oak. This will take place in normal gravity on Earth and also microgravity, far up in space on the International Space Station. The vials contain a class of compounds known as “terpenes” – a set of chemicals which are very widespread in nature and often very aromatic and flavour-active – as well as other molecules. It is the interaction of these molecules with oak wood that forms the basis of this maturation experiment. This is believed to be the first time anyone has ever studied terpenes and other molecules in near zero-gravity. This experiment could explain the workings of these large, complex molecules as they will remain on the International Space Station for at least two years and help uncover new truths about the change that these molecules undergo in this near zero-gravity environment. It could also have applications for a variety of commercial and research products, including future generations of Ardbeg. 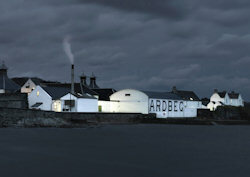 Working in close collaboration with the Ardbeg Distillery team in Scotland, the US team will closely monitor the experiment against control samples here on Earth; both in Houston, Texas at the NanoRacks' facility, and also in Warehouse 3 at Ardbeg Distillery on the Scottish island of Islay. This historic step for a Scottish Distillery will also allow Ardbeg to reach out to scientific bodies across Scotland and throughout the world with regular updates on progress. You can read more about Ardeg Distillery on the distillery website.